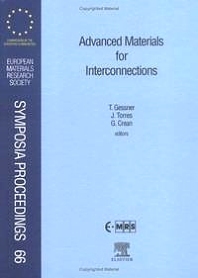 The conference "Advanced Materials for Interconnections" took place in Strasbourg on 4-7 June 1996 hosted by the EMRS Society. Based on the recent trends in microelectronics the main topics of the conference were new materials for interconnects like special aluminum alloys, tungsten and copper as well as low k dielectric materials. 64 Papers were presented at the conference and 51 of these are contained as full length papers within this volume of Microelectronic Engineering. The proceedings are divided into 5 chapters. Chapter 1 related to Metallization discusses cluster equipment for IC manufacturing, copper advanced technology, gap filling, mechanical reliability, deposition technology, electroless and electro-plating, copper metallization copper interconnects and patterning of aluminum. Chapter 2, Process Integration, discusses multilevel interconnect, study on thin-film SOI devices, wet cleanings, influence of material characteristics and deposition processes, copper contamination and metallization, plasma behaviour, CMP processes, sub-micron inverse metallisation, interconnect formation and mechanical polishing investigations. Chapter 3 covers Barriers, and chapter 4 studies, evaluates and monitors Dielectrics. The final chapter looks at modelling comparisons.